Mary holding a sketch of her linoleum carving. I’d like to introduce you to Mary Miller in the way she introduced herself to us. Last year, Mary stopped in to Tribune Showprint Posters, our community partners’ shop, during Small Business Saturday. Her mom was selling decorated towels in a booth in Madjax, and, since she had one of her woodcut carvings in her coat pocket, she decided to come in and show it to us. Mary produced her work for our inspection. It was an intricate folk art winter scene carved into a six-inch piece of construction 2 x 4. We were immediately drawn to the imaginative quality of her work, and we asked her a dozen questions. Mary carves holiday and Valentines Day cards each year, using construction waste materials. She prints 300 of these at home, rubbing over paper atop her carvings with the back of a spoon. She uses computer paper to make her cards because it is inexpensive. Mary learned woodcutting and printing from Bob Hartley when she was a student at Southside High School. We immediately wanted to help Mary in every way we could: by providing her with better materials, giving her access to our presses, and helping her print cards for nursing home residents in an efficient way through donating paper, ink, and sponsoring a mini-workshop there. 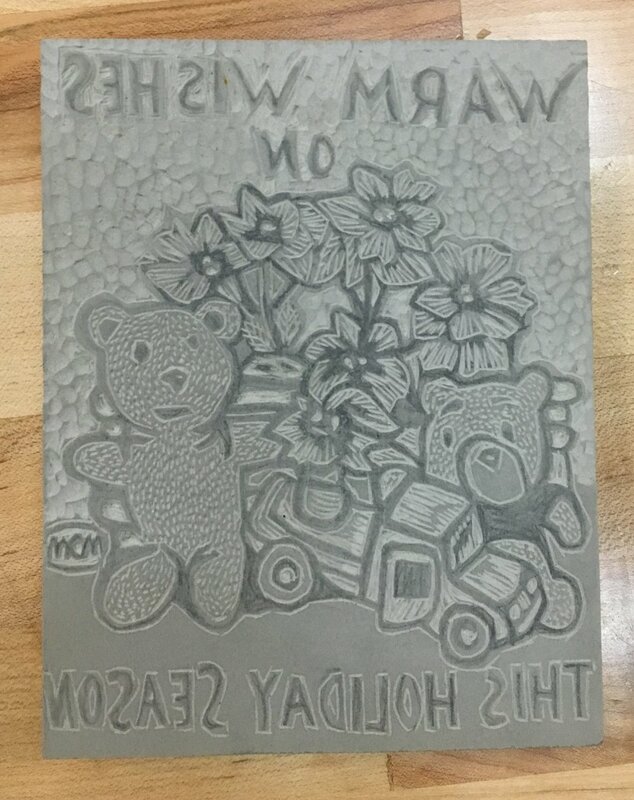 Because common pine construction lumber is too thick and cannot withstand 45 tons of pressure in a printing press, our community partners at Tribune Showprint gave Mary a sheet of fiberboard in which to start carving her illustrations. Mary had amassed several excellent pieces of folk art print carving over the years, so we asked our Madjax neighbor, woodworker Tom Steiner, to try to cut one of those down to a thinner depth to fit it in our press, but the wood was not sturdy enough to print. This fall, Tom, who also had an immediate affection for Mary’s work, gave her a set of sharp carving tools, and Book Arts Collaborative provided linoleum for print carving. All of this attention from simply showing us a piece of 2 x 4 took Mary back some. A naturally shy and reticent person, she first felt intimidated by the new materials she’d been given. She was fearful that her work wouldn’t measure up to quality art supplies and professional printing, but she was also eager to give it a try. In October, she visited us with her tentative drawing: a field of poinsettias and a foreground of toys that she intended to cut into the linoleum using her new carving tools. We were enthusiastic about partnering with Mary, and we happily praised her work, which she delivered, ready to print, a couple of weeks later. Mary’s linoleum carving in detail. Book Arts Collaborative is proud to issue its first Mary Miller holiday card. We’ve printed Mary’s work using our 150+ year old platen press, and the results are stunning. Her cards are available at Tribune Showprint and Gordy’s Fine Art and Framing. Proceeds from the sale of Mary’s cards will go to the artist herself. Carving in linoleum gave Mary lots of inspiration. She used a scrap piece of it to make a design for the envelope flaps. Now she is working on her birthday card idea. Mary Miller will be our featured artist for the December arts walk, and we’ll be selling her hand-made prints for $5 each in our shop that evening, or a set of ten or her cards for $14. Mary will be present if she can get the evening off from her job in the fast food industry and screw up the courage to receive so much attention. Please stop by to admire Mary’s work and support her. We’ll be taking a bed press to the nursing home with Mary this December and conducting a workshop there so that residents can print their own Mary Miller holiday design. Book Arts Collaborative is fortunate to be supported by its community partners and other professionals in the Madjax building, and that enables us to, in turn, support community artists like Mary. We’ll also be working with Mary to print her birthday card design, and Tribune Showprint Posters Shop will be selling it this spring. Mary’s cards, printed and ready to go out to retailers! This piece was written by a Ball State University faculty member and member of the Book Arts Collaborative in Muncie, Indiana. The Book Arts Collaborative is dedicated to preserving and promoting the apprentice-taught skills of letterpress printing and bookbinding through community interaction. It's not just what we make that matters, but how we learn from one another to make it happen. Disclaimer: The views and opinions expressed in this article are those of the authors and do not necessarily reflect the official policy or position of Ball State University, unless explicitly stated.